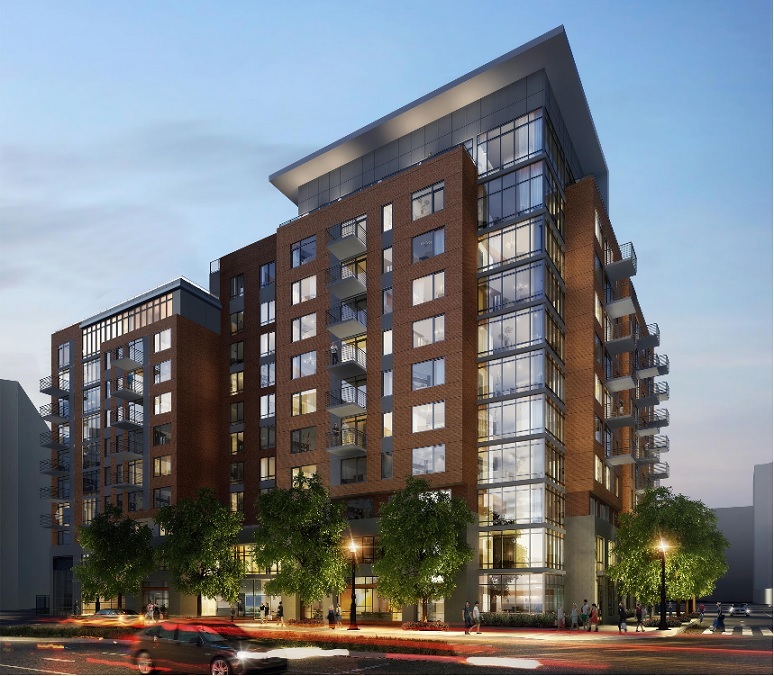 Just one block from the Crystal City Metro station, m.flats will help transform the neighborhood into a more vibrant community. TYSONS, Va. – (RealEstateRama) — Kettler, one of greater Washington, D.C.’s leading real estate development and property management companies, announced today the opening of m.flats Crystal City, an 11-story, 198-unit, high-rise apartment building located in the Crystal City neighborhood of Arlington, Va.
“KTGY designed an exterior aesthetic at m.flats that is contemporary yet restrained. In contrast to the existing 1960s-era buildings, the facades add color, texture and transparency,” stated Rohit Anand, Managing Principal at KTGY Architecture + Planning’s East Coast office in Tysons. Kettler and Kettler Management are owners, operators, and developers of apartments, condominiums, and mixed-use projects in the Washington, D.C. metropolitan area and throughout the mid-Atlantic region. Headquartered in Tysons, VA, the company has developed over 20,000 multifamily units, 5 million square feet of commercial space, more than 46,000 homes in 25 master-planned communities and many of the region’s premier mixed-use communities. Kettler Management successfully manages 30,000+ apartments for Kettler and 3rd party clients from New York to South Carolina and Texas and offers a full range of services to corporate and institutional real estate owners. For more information, visit www.kettler.com. Celebrating 25 years, KTGY Architecture + Planning is an international award-winning full-service architecture and planning firm delivering innovation, artistry and attention to detail across multiple offices and studios, ensuring that clients and communities get the best the firm has to offer no matter the building type or location. KTGY’s architects and planners combine big picture opportunities, leading-edge sustainable practices and impeccable design standards to help create developments of enduring value. KTGY serves clients worldwide from offices located in Chicago, Denver, Irvine, Los Angeles, Oakland, Pune and Tysons. Call 888.456.KTGY or visit www.ktgy.com, Facebook, Twitter, LinkedIn,Instagram, Vimeo, YouTube.